We're really excited to announce we now have KnitPro Symfonie Wood Interchangeable needles in the shop! These needles are made from densified laminated birch wood*. This makes then strong, durable and keeps the tips sharp! They have a distinctive colour, so not only are they a pleasure to knit with but they look lovely too. We have the Symfonie Interchangeable range which means you buy the needles tips and cables separately. So you can mix and match different needles sizes with cable lengths. This lets you create a wide range of circular needles without the need to buy circular needles for each project. 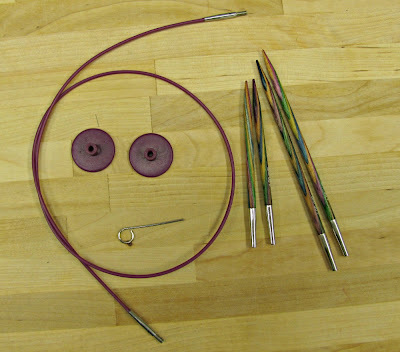 So you don't need to buy 3 different circular needles, just 1 set of needle tips and 3 different lengths of cable. With each cable you get a cable key... you use this to tighten the needle tip onto the cable so there is no danger of the needle tip untwisting whilst you knit. You also get two end caps, so you can remove the needle tips and keep your knitting safe on the cable whilst you use your needle tips on another project! We have a range of cable lengths available and when combined with the normal needle tip you can create 60, 80, 100, 150cm circular needles. We also stock the special length needle tips which are shorter and so when combined with a 40cm cable make a true 40cm circular needle. You can also use these needles to add a lifeline to your knitting. A lifeline is a piece of smooth contrasting yarn placed through the stitches on a row you know you've knit correctly. Especially useful in lace knitting when it can be tricky to spot yarn overs! Instead of using a needle and running it through your knitting, you put your lifeline yarn in the hole at the base of the needle tip (the one you used to tighten the needle tips and cables together). Then when you knit the lifeline is worked into your knitting automatically. We also have a range of Knit Pro accessories including stitch markers, needle size ID tags and sock blockers! As well as some buttons in the same coloured densified laminated birch wood as the needle tips!